Since I posted last week about using a simple kanban to structure workshops, I’ve used the technique with several other clients and have made some subtle but useful improvements. Making time constraints explicit. Ask everyone at the start of the meeting “are there any time constraints you have?”. Write a post-it for anyone that is coming late or will be leaving at a different time than the others. Use a “time constraints” column between the “to do” column and the “doing” column, where the post-it notes are queued in time order. Placing the column here allows people to see what time constraints need to be considered when choosing the next most important topic. If there are known breaks such as morning tea or lunch time then put these in the queue as well. As the time constraint is reached, then pull it into the “done” column (this means the done column can be read from top to bottom as a hi story of the meeting). Is there anything else to add? Is there value in re-ordering the backlog (to do queue)? Adding an “any actions?” exit criteria to the “to do” column. Once the agreed time limit is reached, or earlier if anyone feels the current topic has finished being discussed, ask “are we done? would anyone like longer on this current topic?” if there’s no agreement about adding more time, then ask a second question “Are there any actions we need to record?”. If any actions are needed then these are added to the “actions” column. Add an “actions” column to the right of “done”. I’ve added an “actions” column to the right of “done” where any actions agreed in the discussion can be put. Having run four or five workshops like this in the last week, it is critical is to be strict on not allowing discussion to continue once the timer has gone off (I use the marimba noise from my iPhone’s timer and deliberately let it ring several times if people are talking past the time). I stress that it’s OK to propose to take more time and to see if there’s consensus (by asking ‘Does anyone have a concern if we continue for X more minutes?’), but allowing people to keep talking makes it too easy to continue talking too long. Estimating times. In a few situations I’ve tried asking people to estimate how long they think a topic will take. This can be revised before the task is started. Once it is started the time can be updated by adding “+5” for example, when five extra minutes are added. I’m just experimenting with this at the moment. It has been useful at highlighting that a group has been underestimating each topic, which made people add more realistic times to future topics. 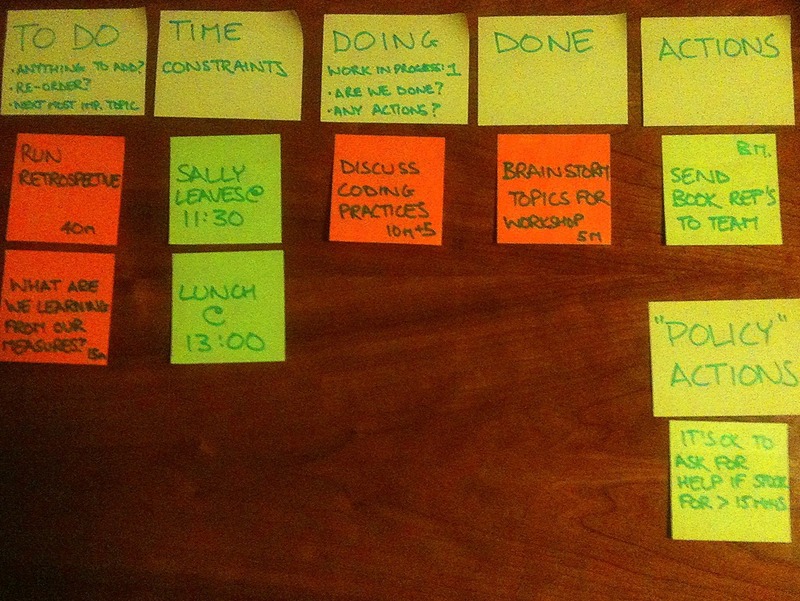 Inviting people to write the post-it notes, re-arrange or track actions themselves. Several times I’ve found myself doing the work for the clients, by writing the post-it notes, re-arranging them or tracking actions. I believe that the effectiveness of this approach can be enhanced if the participants have the experience of doing the work for themselves. Also, it reduces the possibility of error by writing the wrong thing. The response from clients has been really positive to this approach. The client this morning said they were amazed how much they achieved in a short workshop. They also said they felt more energized from that meeting than they had when we’d done a longer meeting without using this kanban format! I’ve also used it with little or no introduction in meetings and it’s been very successful. I’d welcome hearing further about your experiences, or your views on what I’ve mentioned, in the comments. Hi, I’m Benjamin. I hope that you enjoyed the post. I’m a consultant and coach who helps IT teams and their managers consistently deliver the right software solutions. You can find out more about me and my services. Contact me for a conversation about your situation. Awesome stuff. I am glad our experiences have been so coordinate. People not only have responded well, they’ve responded as if these were the best meetings they’ve ever had. I am skeptical about the CFD … but because I am skeptical I’m going to try it in my next meeting. My concern right now is that it’s a distraction and will cause stresses to prematurely end conversations in order to make the chart look more productive. But I want to see what that feels like. I was initially worried when you said, “it is critical is to be strict on not allowing discussion to continue once the timer has gone off .” Because I thought you were truly timeboxing the conversation … so I want to be clear to readers of this by underscoring what you said next … that timepoint is a clear and immediate check-in with the group about whether they want to continue talking. The group is perfectly within their rights to continue a conversation for as many time cycles as it takes for them to feel comfortable with the result. Thanks again for this. It’s fantastic work. Thanks for the detailed comments. I’m enjoying the excitement of trying new things, reflecting on them and coming up with further experiments and improvements. It reminds me of when I first used kanban with a software team three years ago. I’ve only done the CFD twice, and in both cases it was to a team who wanted to investigate whether the CFD would be useful with their software process. The purpose of using it in the meeting was to give them experience of building the chart themselves, so that they could understand what the chart showed and then get an idea of what it could be used for. The chart just shows the rate of movement of topics into the ‘done’ column and the rate of additions to the ‘to do’ column across time. I didn’t notice that the CFD created any time pressure in terms of prematurely ending conversations. 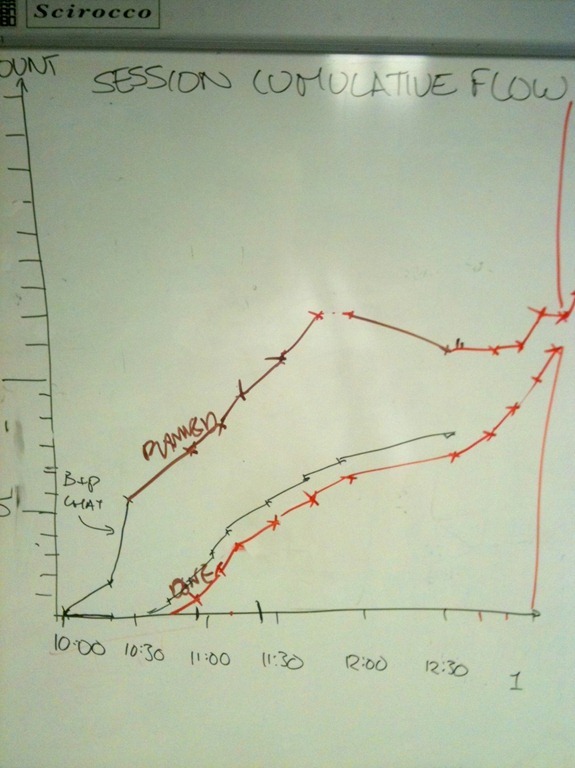 The information the chart gave was used to scope how long we spent on each topic, rather than speeding us up whilst we were ‘in’ a topic. I don’t really see the reason to use a CFD in a general discussion – If you can see some value, then I’d be interested to find out more about it. I agree with you that the point of the time on the topic is simply to trigger another decision point, which starts with asking “are we done?”. On reflection “strict” might have been the wrong term – I wanted to highlight that if the time is not followed then my experience is that it can be easy for people to keep talking and difficult to trigger a group check-in. As you say, if there’s value in the current topic continuing then that’s great – go with the value – the time operates to provide a structural trigger to encourage people to stop, step back and make the decision about the value of continuing by thinking about the broader context (e.g. it may not be possible to cover all of the other topics or to spend as long on them). Thanks for the post – very helpful. Thanks for the feedback on your experiences! When we do the voting for topics, we just do a quick intro and then everyone gets two votes. You can vote twice for the same thing or for two different things. While there is a bit of talk up-front, I’ve only had two experiences where people either over-introduce or start a conversation during the introductions (out of probably 200 of these meetings). Certainly, though, if people start to really get excited about tossing in stickies … let them create as many as possible and then figure out what to do about it. If you limit them to three, they will start censoring themselves right at the beginning. Just to say this worked really well for our session on Tuesday and we got through a huge amount in a well organised and structured manner which I simply do not think we would have done otherwise. So many thanks indeed and, with your permission, will be adopting this as much as possible in future! One small point which I might change is “Policy Changes” to “Ground Rules” – this is the expression we generally use for setting out the way meetings/sessions are run. Also very useful for personal planning which I, sort of, do anyway on a board in my home office but this will allow me to structure it a bit better. So great stuff and catch up soon.